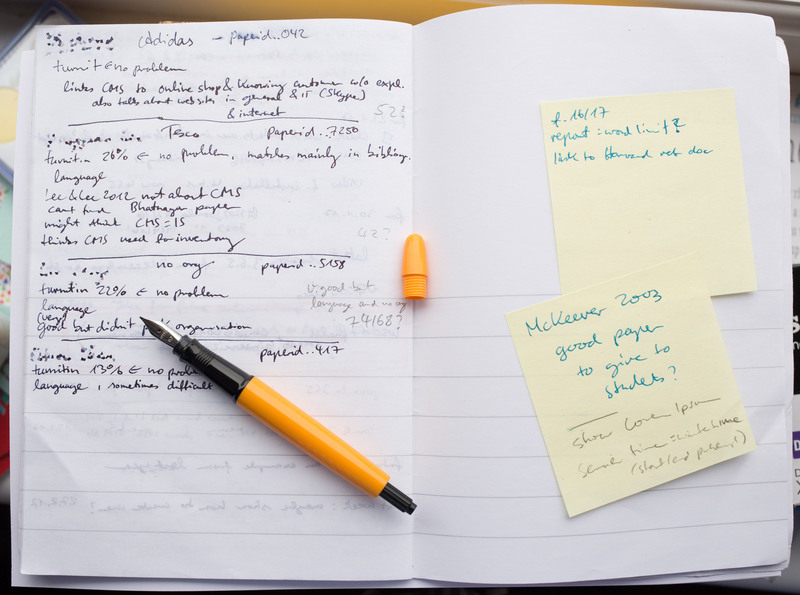 Welcome to a new series of blog posts about Staedtler’s Wopex pencils. 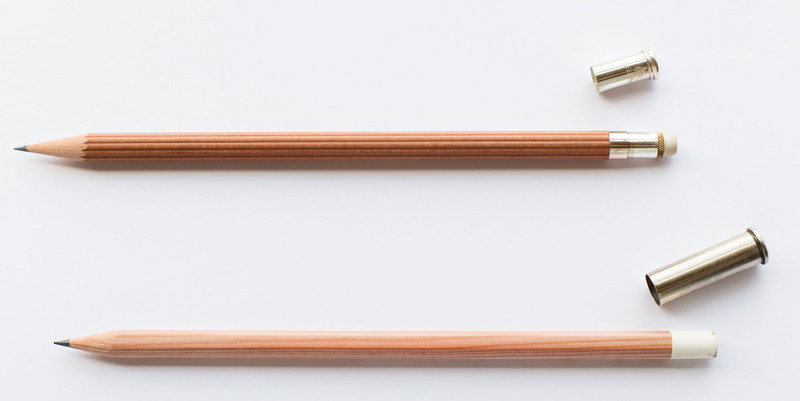 The idea is to collect information about Wopex pencils while details are still available. By now several bloggers, including me, had to find out that stationery manufacturers don’t always store information about their products and in my opinion it would be a shame to lose the existing knowledge about these products. As explained in the past Staedtler has changed the way it’s using the term Wopex. Instead of calling the pencils Wopex the term is now only used to describe the material these pencils are made from. This started in 2015 and by now you won’t find any Wopex labelled pencils anymore on the German Staedtler web site. 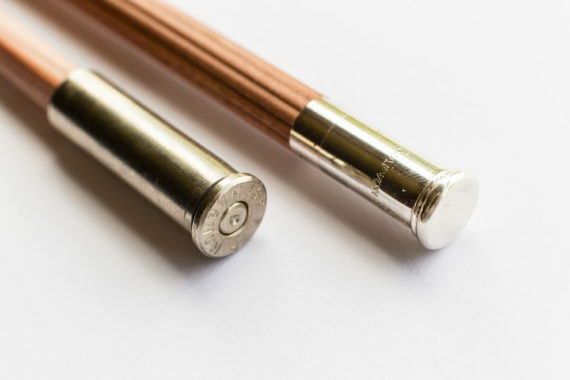 Instead these pencils are sold as the Noris eco or as the Staedtler 1801. In other markets, mainly South Africa, you can also get the Tradition eco, a Wopex based version of the Tradition, similar to the Noris eco. Staedtler’s Neon Line was introduced at Frankfurt’s Paperworld in January 2013. Neon refers to the fluoresent body of these pencils. 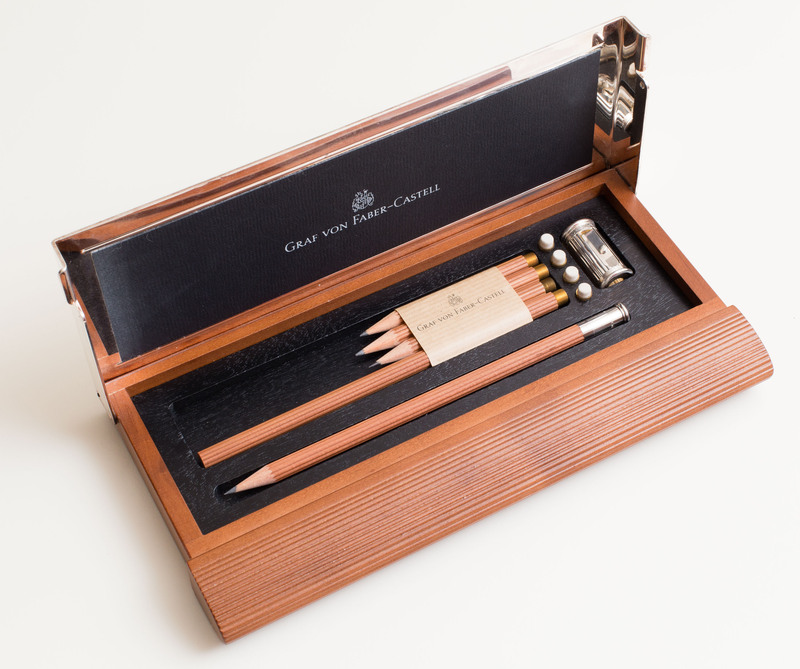 The pencils themselves contain normal Wopex graphite leads. Back then the pencils were still Wopex labelled, but the latest Neon Line pencils are sold without Wopex or even 180 printed on the front of the cover. This information has also been added to the Stationery Wiki. Sticking to the Lamy theme from the recent blog post about blue Lamy Safari fountain pens from the 1990s and now we’ve got another Lamy blog post today: Their special edition pens you normally don’t see in the West: the Pirates of the Caribbean (Dead Men Tell no Tales) and the Star Wars pens. Lady’s special editions follow a similar recipe: Take Lamy’s Line Friends Safari, for example. It’s a Safari with a different colour and a clip attachment. The colour of the special editions isn’t always different and the main difference of these special editions to their ‘normal’ counterparts is the clip attachment. They also often have extras (converter, special packaging) and a higher price. 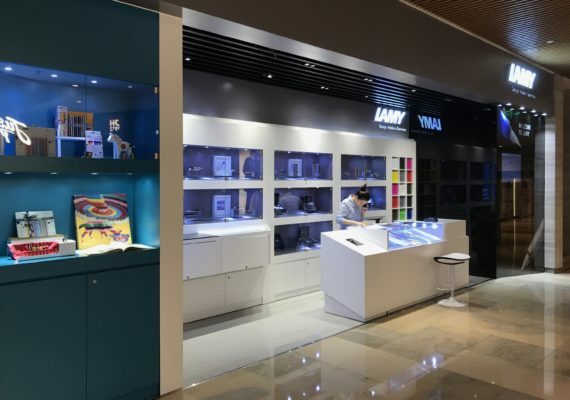 I’ve shown a few different Lamy shops in Shanghai. Here’s one I haven’t shown yet: The one in the Jing An Kerry Centre1. 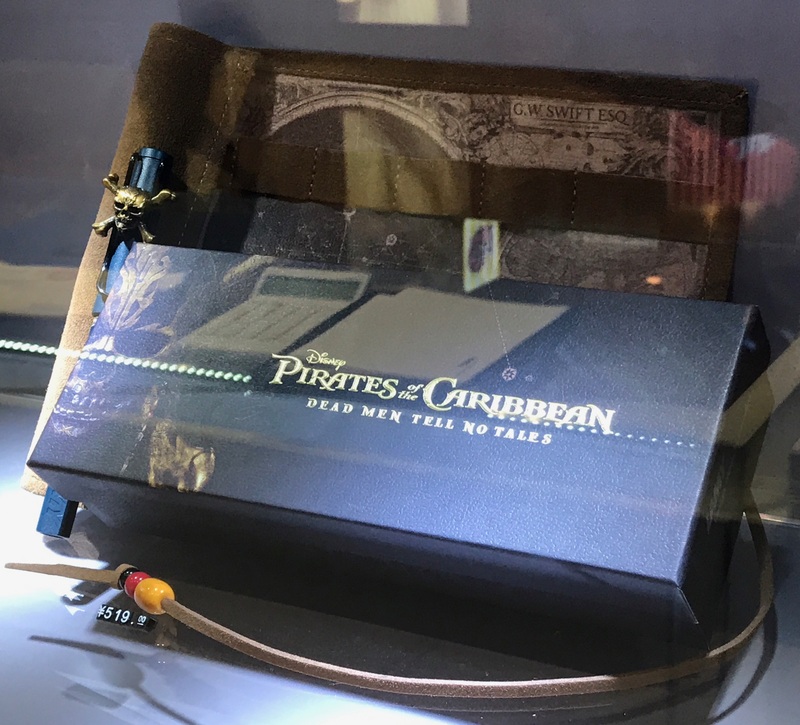 The Pirates of the Carribean themed pen looks like a Safari in the current Petrol colour with clip attachement in the shape of a jolly roger skull. You also get a converter and a leather roll as part of your set. The Pirates pen on the left and the leather roll in the background. Excuse the reflections in the photo. The pen was behind glass. 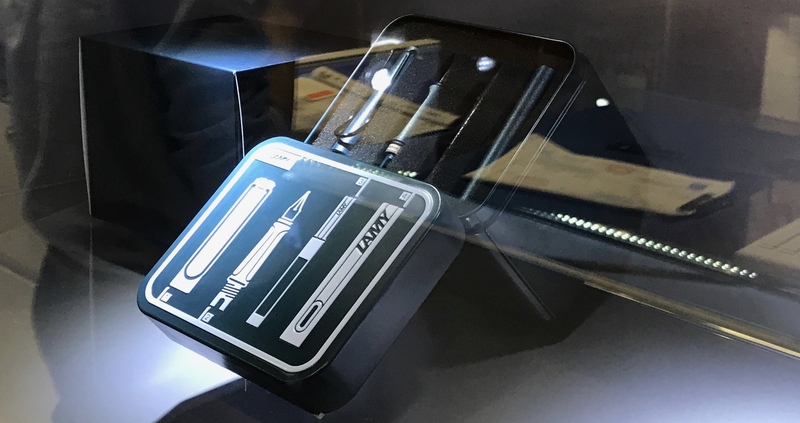 The Star Wars themed pens are Lamy joy2 fountain pens. If you are not familiar with the joy: the front section is the same as the Safari’s, but the main body is much longer. It is kind of a desk only version of the Safari. Desk only because the long body makes it unsuitable for easy transport3. 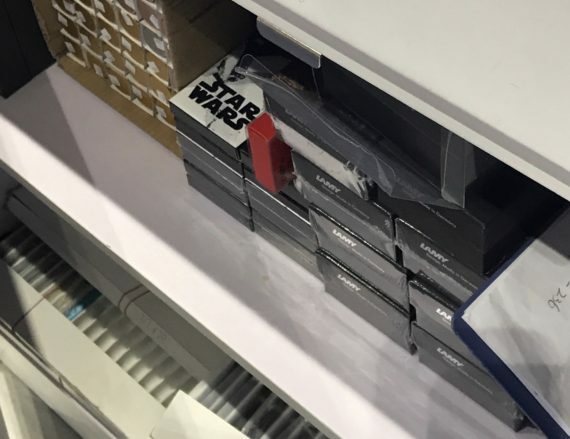 The Star Wars joys have ‘normal’ nibs. I mention this because the joy is also available as a calligraphy set with italic nibs of different widths. The black joy comes with a Vader clip attachment. The white joy comes with a Stormtrooper themed clip attachment. The price is only slightly higher than the price of a normal Lamy joy in Shanghai: A normal joy is ¥380 (~$56; £44; €50). The Star Wars set is ¥4184 (~$$62; £48; €55). It comes with a converter. The price of the Lamy pens in Shanghai is a bit higher than in the West, but you also get more. 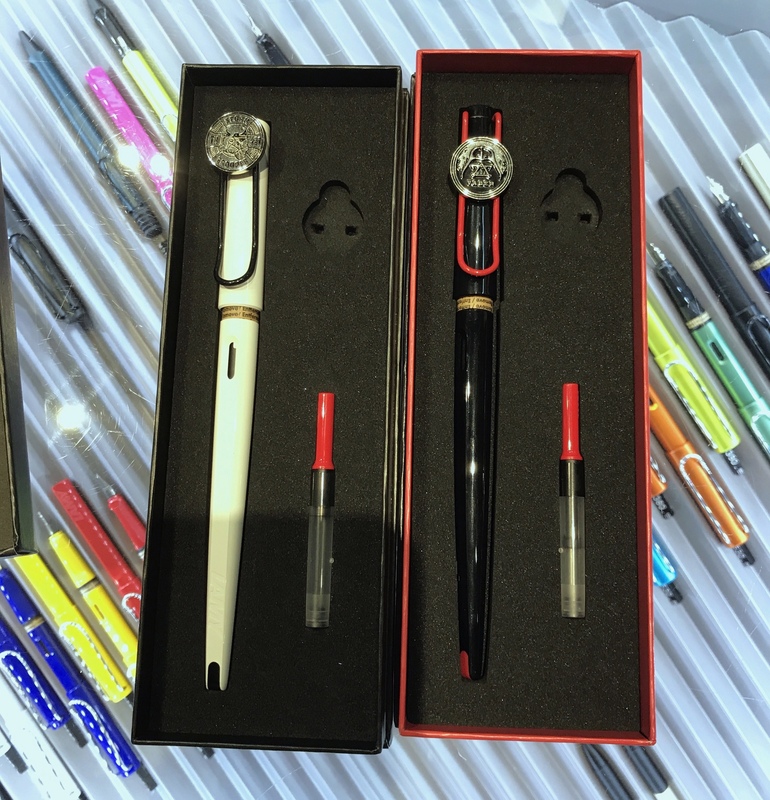 The pens I’ve seen in Shanghai often come in nice boxes I haven’t seen in Europe. They also often seem to include converters that would be charged extra in the West. The special edition pens are only slightly more expensive than the normal editions5. The Safari Petrol. I believe this version is also available in the West. Excuse the reflections in the photo. The pen was behind glass. I assume the reason why you normally don’t see these special editions in the West has more to do with licensing than with demand, especially since they are not much more expensive than the normal versions of these pens, so they should sell well anywhere – but that’s just a guess. As I know most of the readers of my blog I might as well write this publicly: If you want one of these pens let me know and I’ll try to get one for you. If you want to know more about Shanghai’s Lamy stores have a look at this blog post about the store in Raffles City, the stores in this comment or the one in this blog post. Today: a quick look at two blue Lamy Safari fountain pens – one from the early 1990s and one from the mid-2010s.